As we in southern Oregon discuss the future of our Sacred Salmon Ceremony at Ti'lomikh Falls, it has been insightful to watch the cultural and political drama being played out up north at Willamette Falls. It seems Indians can barely do anything traditional these days without it being accompanied by a net-full of squabbling and bickering, and eventually, a lawsuit! If I were one of the Salmon People, I'd turn tail and swim back out to sea. Meanwhile, upriver on the Columbia, She Who Watches -- the most famous of the Old Time Culture Watchers -- looks annoyed as she shifts her gaze toward Willamette Falls. As she has always done, she continues to observe the goings-on of the People. But it appears that few folks are looking her way. Matching our eyes with hers, as we have done for centuries, reminds us to get along with each other, be grateful and generous, and share. 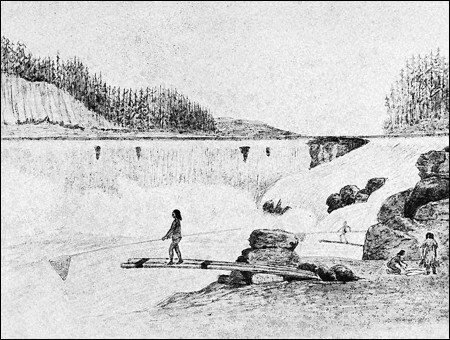 The images show Tsagaglalal (She Who Watches), a drawing of Old Time fishing at Willamette Falls, an 1880 photo of the falls (look closely to see fishing from a canoe on the left and the fishing platform on the right), a contemporary view from above the falls, and Grand Ronde Tribal Chairwoman Cheryle Kennedy and Tribal Secretary Jon A. George watching as tribal employees launch a boat to build a fishing platform at Willamette Falls. by Cassandra Profita of OPB, October 1, 2018. 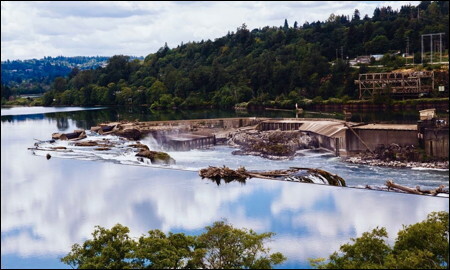 Oregon City, Ore: Grand Ronde Tribal Chairwoman Cheryle Kennedy is standing above Willamette Falls in Oregon City looking down on a torrent of whitewater alongside the Portland General Electric dam. Somewhere in the water below, tribal workers are making their way in boats to the site where they hope to build a fishing platform -- the first to be built at the falls in a generation. The tribe had planned on accessing the site by land through PGE property but they recently learned that's not an option. 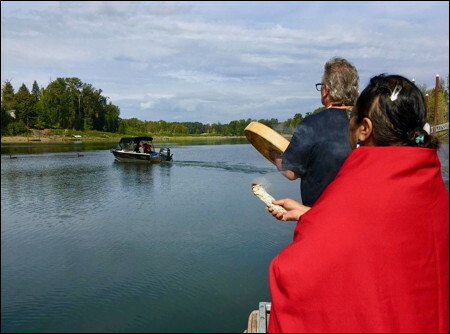 The tribe has permission from the state to build a scaffold and catch 15 salmon for ceremonial purposes on state land below the falls. 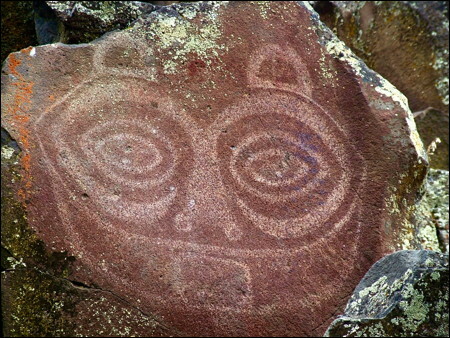 But the Warm Springs and Umatilla tribes want the state to withdraw that permission because, they say, it interferes with their treaty rights. And PGE has appealed the permit arguing the land in question actually belongs to the utility. Without access to PGE property, the Grande Ronde have only one treacherous route to their controversial platform site. 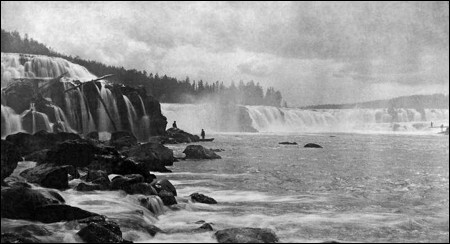 "Willamette Falls is second only to Niagara Falls in volume and velocity of water that spills over the falls like this," Kennedy said. "So, it's very dangerous. To force us to come through these extreme rapids, it's just an awful, awful thing." Kennedy said her tribal ancestors fished here on platforms along with the members of many other tribes. "If you look back at some of the drawings, they were of our people who were fishing with scaffolds and dip nets," she said. But Chuck Sams with the Confederated Tribes of the Umatilla Indian Reservation said the state's decision to permit a scaffold for the Grand Ronde flies in the face of an agreement other treaty tribes made not to build scaffolds at Willamette Falls. "This platform would interfere with our right to harvest lamprey in a safe manner in addition to blocking our rights in the area," he said. Meanwhile, PGE claims the land where the Grand Ronde scaffold was permitted to be built isn't actually state land. The utility has appealed the state permit and the opposing tribes are threatening to challenge the state permit in court. But so far, the Grand Ronde is moving ahead with their plans, albeit through treacherous waters. "We are a people of the fish," Kennedy said. "It's beyond me how anyone could object to this, but there's objection and we've been denied access to the easier route or the safer route of acquiring fish."